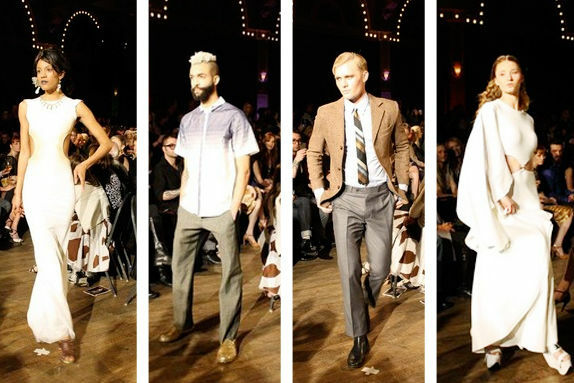 Another year of Portland Fashion Week wraps up. Thanks goodness for Saturday night’s fashion week finale. After that many shows, people, photo editing, writing, elbow rubbing, etc. I was in such desperate need of pizazz I just kept coating on hot pink lipstick to try and rev up. But, thanks to a little show called Project Runway, we managed to get some pizazz out on the runway and I gave my clown lips a rest. Before the show, I popped backstage to take a minute to do some quick interviews in between the mayhem. 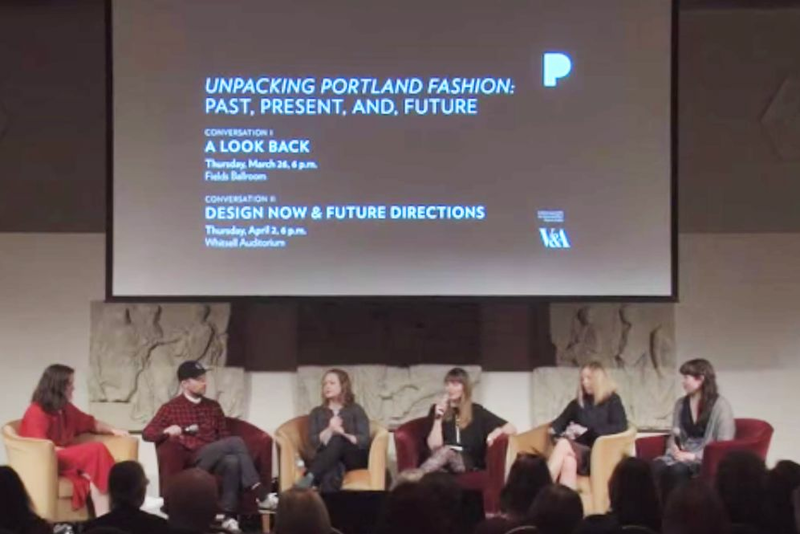 Jay Sario was back for his second year of PFW (which he credits producer Tito Chowbury for making happen) and told me he thinks Portland is a “city where you can find great dressers.” That’s a compliment I’ll take from a New Yorker. Michael Costello took a moment to chat with me while also brandishing a curling iron and hair spray giving his models bouncy shampoo commercial worthy hair. He spoke of many inspirations for the debut of his resort line, but after I heard “Indiana Jones” and “Bohemian”, I was already sold. Add to the fact that he mentioned he only sketched 10% of the collection in advance and let the rest “come to him” while draping and I high tailed it out of there to my press seat like an eager little beaver. The show began with Sario’s structured, tailored and thoughtfully seamed pieces. Everything he does always slightly reminds me of a badass female warrior that also wants to look pretty. That in iteself is pretty cool. The metallic gray material was the perfect hint of shimmer in person and the jacket detailing was impressive. Seattle knit wear designer Helen Sharp somehow was thrown in with the boy party, but I’m always a sucker for hand loomed yarn ensembles. My favorite looks of hers were the color blocked black and white pieces with a particular standout of a long slubby cardigan over a striped bikini. And while I commend her for only merchandising the outfits with her own pieces, knit booty shorts are a tough sell for me. Ideally, I think Sharp could collaborate with another Seattleite apparel designer for some lovely linen shorts or pencil skirts for a little match made in the stars. A look from Michael Costello's runway collection at FashioNXT. Bryce Black sent one (yes, only one since he did just have to design an entire collection for NY fashion week last month that Project Runway got to keep) dramatic Avant Garde piece of leather and feathers down the runway while an Italian opera soared in the background. Where was this piece during your avante garde challenge on the show Black?! And finally, Michael Costello sent his breezy, lovely, flowing resort wear line down the runway in a lux looking display. I turned around at one point half expecting to be transformed to a poolside with a waiter sauntering up Mai Tai in hand. While sadly, that part never materialized, what did happen was a collection of halters, jumpsuits, and every kind of dress you’d ever require for a hot weather vacation/occasion. The draping was divine, the fantastic head pieces spot on and the sheer (pun intended) difference of the pieces to our normal NW gear made these sunny ensembles some of my hands down favorites of the entire week. After the show, I hit the after party to see a joyous crowd party down. In between watching the over tired volunteers toast champagne and dance with designers I had a moment to think about Portland Fashion Week. Is it perfect? Nope, not at all. I had issues with some of the collections and the start time and so on. However, it’s still responsible for my introduction to designers like Leanne Marshall, Suzabelle, Duchess and Ms. Wood. Designers I have massive respect for and continue to follow their work. And as long as there is still the opportunity for me to find some diamonds in the rough, I’ll keep putting up with overly loud techno music and late start times. 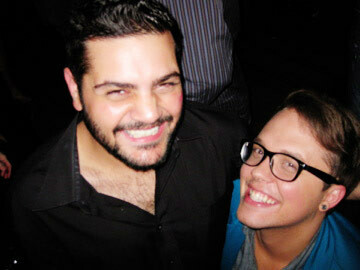 Project Runway alums Black and Costello buddy up at the after-party. So, PFW, until we meet again… I bid you adieu.